The pictures of part 1 of the series focus on places where the current crisis appears in a symbolic way. In contrast, part 2 shows close-up portraits of people viewing the scenery with scepticism and tension, but not without any hope. One of the numerous empty investment ruins, surrounded by an iron fence, provides a symbol of the crisis. 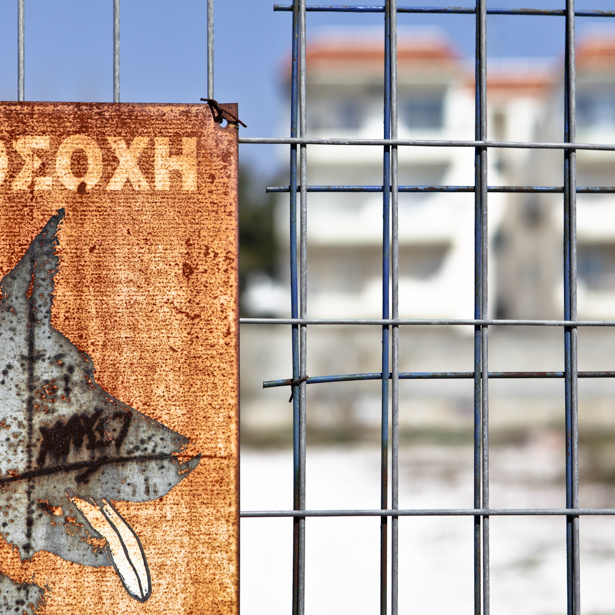 Ironically a rusty sign warns of a watchdog which has not existed for a long time. A further issue is the arms deals which are ruinous for the country and its political life: One of the pictures makes the spectator peep through the sights of a cannon and thus raises the question of responsibility for these actions. Finally there is a lady of bewitching beauty on an advertising poster, her eyeball covered by a big diamond. Or even replaced the diamond? Who or what decided on that arrangement? The picture refers on inside talks of Goldman Sachs investment bankers about their business practices. The portraits were shot during election rallies. They are surprising in multiple respects: The searching look and the vivid interest of these people represents an attitude which hardly ever can be observed in usual policy making. Astonishingly, the hope of change still shines out, despite the drama of the crisis, the fury about its originators and the disappointment about the failings of the responsible politicans.